The promo is back with more credits! Some rfders told me they got more credits than the regular $200 or $300 credits. Telus has Telus Wifi = Same thing as Shaw open. Edit 4 : Some stores are able to offer the $60 with internet 150 promo. You can probably ask for $55 since it's available. Edit: 5 Internet 300 = $55 is back! Edit 6 = new update with my Telus rep. Deal is sweeter! Any fibre address = get $400 instead of $300 + Internet 750/750 = $75! He said this outbound sales rep can offer an additional $100 credits. If the store people cannot offer you these promos, find the outbound reps.
Edit 7: FOR EXISTING CUSTOMERS: If you cannot get a better deal from retention, he is a way to get it. Worked for several rfders already. - Cancel it and wait for 24 hours. - If you got denied, just call Telus and say you want to join back with them. Then you don't need to pay for the cancellation fee. Last edited by Thatdealguy on Apr 1st, 2019 6:55 pm, edited 14 times in total. Added by Saltywetguy : In order to get the deal, PM Thatdealguy with your contact info for follow up. For the home telephone option, they dropped my fee from $24 to $12/month. So, total $72+tax! That got me from $124 (taxes included) per month down to $72+taxes... Thank you OP! If you cannot get this deal, just switch to Shaw. How do we get this deal? Looking for 150 (non fibre area) with Optik TV in Calgary. The store might be able to offer it or any TELUS outbound sales. What are the data caps on these plans? 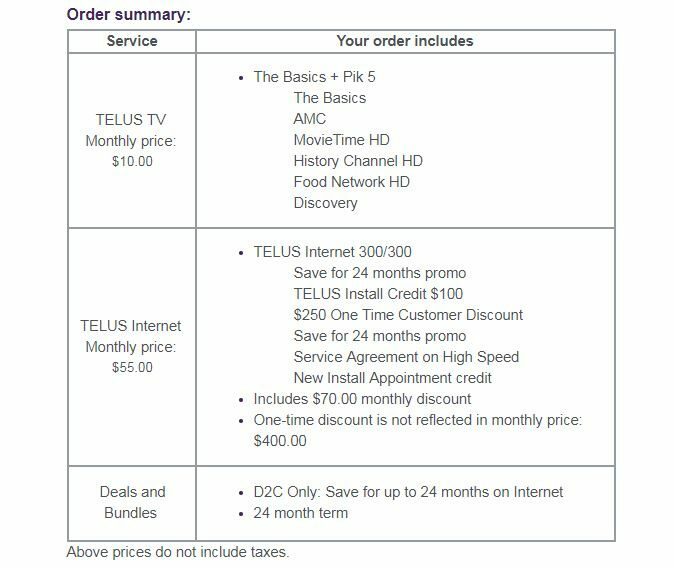 Telus says they have never heard of this deal and won't do more than $100 credit for new customers. If there is an email, link can it be PMd to me? All unlimited when you signed up for 2 years. Got a similar deal last friday. Can confirm. Optik TV $10/month fee is actually waived according to my rep. While I want to believe this is available; got an email, plan number, or particular agent that can activate these plans? seems like outbound sales ( door to door people) can offer this. As mentioned from the previous thread, those people offer the best deal out there. Thanks for sharing the details. How did you sign up? Store? Call sales? Door to door offer? Is this price fixed for two years or increases after 6 months ?